To clarify: I am NOT petitioning for "the removal of the transfer system" on this page. I have no idea how this misrepresentation got started but nothing could be further from the truth. I would rather put up with pet trades than lose the transfer function altogether. Clear? Then I'll begin. Here we have two things: A blue Ixi plushie and a Blue Ixi. Both of these are cute, cuddly and can be found all over Neopia. Some people think they're cute; others would much prefer a Darigan Scorchio. However, there the similarities end. A blue Ixi plushie, no matter to whom it belongs and how long it's been in existence, is a blue Ixi plushie. There's nothing individual about it. It can be sold and replaced with another with no apparent difference. Its only attractive attributes are those described in its name: it's blue, plush, and looks like an Ixi. A blue Ixi, on the other hand, can be any number of things. Male or female, old or young, vicious bully or timid child, fierce Battledomer or intelligent bookworm, living a life of luxury or surviving on omelette while the owner saves for a PB, elegantly named or followed by a string of numbers wherever it goes; the fact is simple, no two pets in Neopia are ever exactly the same. So while it's possible to put a price on a blue Ixi plushie, the same as any other, it's ludicrous to think of doing the same for a blue Ixi. Or it was until Friday night, 9th day of Hunting, Y10. 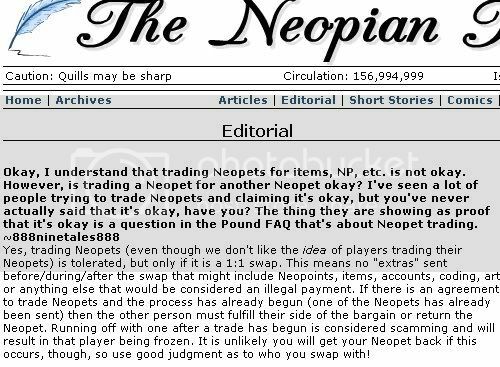 In an astounding example of poor judgement, TNT's editorial-writers authorised the "trading" of pets, for the first time in Neopia's history. Some of Neopia's citizens are celebrating. Others, like me, were worried about this from the start. Trading isn't a good thing. And here's why. Take a look at the Pound Neoboard that's taken so much strain off the HC in the past few months. I can bet my weight in Toy Sailboats that there won't be anybody there talking about the great new home they can offer to someone's foster pet, or the prissy girl Lupe who's looking for a home with lots of Usuki dolls. The introduction of pet trading has created a scale on which some pets are "better" than others. Now, I'm not saying that there aren't some pets that YOU are allowed to like more than others. For the record, I love Acaras and can't stand Darigan Xweetoks. But this new "scale" assumes that there is some sort of objective value that can be put on a pet. And yes, I've already seen that value being expressed in terms of Neopoints. Often, those who talk about the "price" of a pet are doing so quite innocently, showing off the fact that their Poogle cost them 850k to paint, plus however much else for the Kadoatie. But this has quickly turned into a market-- is an unconverted Kiko "worth" the same as a Draik? Should you refuse to trade a Christmas Kyrii for a Cloud Cybunny because the former is "worth" less? This has to be one of the less-brilliant decisions TNT has ever made. The charm of being able to imagine pixels as pets has been completely destroyed by the way in which different species are being valued against each other. --fidicina By putting a "value" on a pet, you're disregarding the memories, character and individuality that comes with that pet and reducing her to nothing more than a paintbrush with a name-tag attached. Pets are not paintbrushes, nor were they ever intended to be. My Usul, Mem, is coloured Red, with a less-than-perfect name and average stats. Does that mean it would be in any way understandable for me to trade her for a Marshmallow Grundo? Absolutely not, and if anyone tries offering they'll be out of the door faster than an evangelical vacuum cleaner salesman. Why? What's wrong with her? --a Neopian who shall remain nameless, learning that I was adopting out a pet "for free". Your pets are not collectable cards or bargaining chips. They are pets, and raising them to be the best they can be is what provides you with all the challenges, fun, and good memories this site has to offer. Pet trading is encouraging people to treat their pets as disposable for the sake of achieving their goals more quickly. In doing so, it's ignoring something TNT and Neopians have always held to be true. Those wishing to promote trading pets may say that the new rule actually helps pets get new homes. As a matter of fact, foster parents are pulling out of the adoption field, unable to ensure that their foster pets won't simply be used as bargaining pieces to get something better. TNT have put in place an incentive for people to get pets from us (who are giving away pets for free) in order to help them start 'trading up', rather than because they truly want to give a home to our fosters. 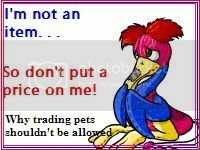 Giving a pet to a trader is in no way guaranteeing that pet a forever home. Anyone who thinks of pets as swappable commodities is going to hold less responsibility towards their new pet than someone who sees a pet for more than just her color. what reason do you have to believe he won't do the same with yours when he gets fed up with her? That's not a forever home. That's the kind of uncertain life that I wouldn't really wish on a Petpet, let alone any of the fosters in my care. Small wonder that pet trading has caused some owners to take their adoptable pets down. Some improvement. I go to a board, see a person's board saying: "pet looking for a good home!" this girl comes and says, "I'll take her!" right when the pet's owner says "fine I guess I'll nver find a good home," I go to the girls lookup that wanted the pet. and it says "(pet's name) is currently UFT". With so many foster parents despairing of the situation and either pulling out of the field or turning to trading themselves, it should come as no surprise that adoption is now being seen as a less evolved form of pet trading. To newbies with join dates later than this spring, trading has always been there, while the concept of adoption is gradually becoming a stranger and stranger one. What would I write if I wanted to trade my pet, but didn't really want to trade her, I wanted to give her away and not get one back? --A newbie on the HC struggles for the word "adopt". What was one of the first lessons we learnt, sometimes quite painfully, as newbies? Don't ever give up something for a promise. There is no secret of Marshmallow World that you have to pay 10,000NP to get. Neopoint generators don't work, and the HTML designer you let onto your account probably stole his example code the way he's just about to steal your favourite pet. Well, no-one can blame the poor newbies for being confused now. Trading a pet involves giving up your pet without any guarantee the person on the other end will hold up his end of the bargain. And for all of you saying "No-one would scam that way, they're too smart to get themselves frozen"-- THEY WOULD. There is a certain despicable breed of scammer that delights in making people's lives a misery. When his account gets frozen he'll just laugh at the fact that your pet's just been sent on a one-way trip to the Land of Eternal Dreams. Go to the Help Chat and the Pound Board and you'll see them: victims of trading scams crying for their lost pets. Yes, scamming is reportable, but this could have been prevented so long ago if TNT had thought about it. 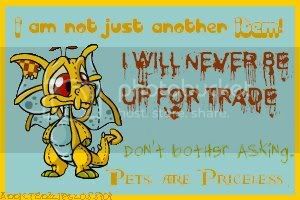 When even the pets aren't safe in Neopets, what is safe? Update: There is now a "safe exchange" option that guarantees a fair trade between Neopians. This is progress, of a sort, but there will always be people who try to get around the restrictions to scam others. You may not swap pets permanently, however, as that is akin to selling. Unfortunately, it would seem that TNT have forgotten their own advice. Pets are now tradeable, and the inevitable began to happen less than 24 hours later. TNT are adamant now that trading a pet for an item or Neopoints is against the rules, and so far, have done a decent job of freezing those who try. It isn't inconceivable, though, that people might trade a pet not actually for another *pet* but for the Petpet attached to her. Or for the clothes she's wearing. 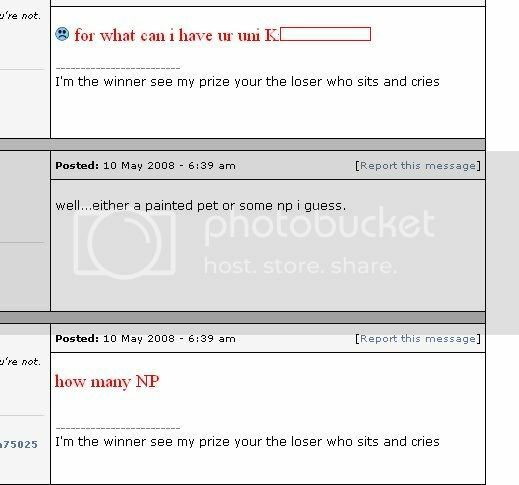 After that, it's only a matter of time before people start wanting to sell pets for Neopoints proper, and at that point it won't be certain that TNT can stem the tide. I was told by a Neopian who wished to remain anonymous and who since appears to have vanished from the site that some users are even attempting to sell their pets for Realworld money. Whether this is true or just a rumour, it highlights the worrying things that can happen when our pets are seen as nothing but a commodity. Yes, TNT have made trading official. But this doesn't mean hope should be lost! The pet clothing system, the removal of orange spots from purple pets, and the Safe Transfer system itself were all implemented years after they were first suggested. In many cases, this required a complete U-turn on TNT's part. It does happen-- and it still can! Write to the editorial and put TNT on the spot. The more people write in, the more seriously this position is likely to be taken. Fire off a support form to TNT's Ideas/Suggestions department, letting them know exactly what you think. Use any of the points from this page (no direct copy-and-paste, please, as TNT has officially stated they ignore such submissions) or just use your imagination. If your site language isn't English, don't assume your support form won't be useful! TNT speak many languages, and if you play the site in it, it's a fair guess they'll have it in one of their offices. No editorial bombing. If you're going to contact TNT, keep the tone of your submission POLITE, and please don't send any more than ONE editorial submission and/or ONE support form per person. Yes, this means no submitting from side accounts, either. While putting pressure on TNT is important, Pets Are Priceless does not advocate staff harassment or breach of the T&C. Many newer users are only trading to get their dream pet because they don't realise there's a more caring alternative. Foster parents still exist, and we're working hard to find real, loving homes for our fosterlings. Take a banner or button for your lookup from an adoption agency, or recommend one to a friend you know is looking for a new Neofamily member. It's important not to let foster parents drop off the radar, and you can help make sure we don't! The Pound board may be full of pet materialism, but that doesn't mean YOUR favourite Neoboard has to be. If people try to bring discussion of the "prices" of Neopets to your board, tell them gently but firmly that it doesn't belong there. Stick up for anyone whose pets are being insulted because of their names, colours or species. Try to make your favourite Neoboard or guild board into a place where all pets are welcome, regardless of supposed "value". Pets are Priceless does not advocate attacking individual traders. Our issue is with the concept of trading itself, not those caught up in it. By all means talk to your friends about why trading is a bad idea, but unprovoked or ad hominem attacks on random traders minding their own business just gives a bad impression of our side. And, of course, the other thing you can do is to spread the word. The more people we can rally to the anti-trading cause, the better chance we have of getting somewhere with TNT. This wonderful little button, made by popolopolis_the_3rd_, will fit on any petpage, pet lookup, userlookup or shop. Put it up and let Neopia know what you think. This charming link button was made by iluvchocolate_91. This neat little notice is by velveteen! Put a link to this page in your Neoboard siggy! Fantastic banner by faugn-- more are here! By jrtluver1994-- thanks for the support! I mean people don't stop to think how beautiful some pets are.....Its not their worth,Its how much you love them and care for them...I mean a blue hissi compared to a maraquan eyrie,thats just plain rude how people are like NTY,Its not worth it,and n00b. 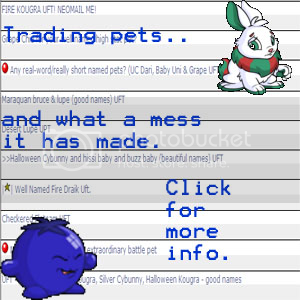 On the pound boards, I look for my dream UFA pet but all I find is "UFT". Are you going to put a petition here?/Can I join the Rebel Alliance? No. The Rebel Alliance list isn't a petition, just a list of those who originally helped me out, and to be honest, I don't see myself putting one up. TNT famously doesn't pay much attention to petitions except on very rare occasions, and I don't want people just to Neomail me and think they've done their bit. Write to the editorial, guys! That's the main thing. What do you have against the transfer system? To clarify, since some people seem to have twisted my words into meaning something they didn't; I do not want the transfer system removed. My argument is with TRADES and trades only. 'Kay? If people don't like trading, can't they just not trade? If people don't like air pollution on Earth, can't they just not drive cars? Would that it were as simple as that. All over Neopia, situations have been subtly altered by the actions of those who DO trade, and often non-traders get caught up in them. Witness the new reactions to us foster parents, for instance. Pet materialism affects all of us. Aren't you worried about directly opposing TNT? Let's get this down for the record: if TNT have any problem with this petpage, they can Neomail me and I promise to take it down immediately. As things stand, however, I do not believe this page breaks any rules. What if I don't believe pets can feel sad? Then believe that humans can-- humans who can't get the pet of their dreams because the foster parent has quit, humans who see the pet they thought would go to a good home being traded to someone who won't ever play with her, humans who've been scammed out of their pets by a shameful fraudster. Not all the anti-trading arguments are from the pet's point of view. Can I make you a banner/button? Sure. Don't get worried if I haven't put it up within 24 hours, I get a LOT of mail. Haven't you got anything better to do than making a petpage against trading? Because keeping a petpage up to date is such intensive work that obviously I must do it all day long, huh? For the record, I don't. Even during vacation from university, I have essay work, gym sessions, video games, protest demonstrations, cakes to bake (sometimes FOR the protests), my violin to practice, books to read and friends to stay in touch with who aren't Neopians. Neo is a big part of my life, but not all of it by any means. Can I translate this page into (insert language)? As long as you let me look at the result, I don't see why not. I'll even link to you! Thanks! Did you get your editorial form in? Sorry to hear you didn't like it. Thanks for reading anyway, and have a nice day! 02/12/Y10: Well, it seems TNT have removed one of the issues on this page by creating the safe exchange option. I'm a little confused about why people expect me to be cross about this. If I'm opposed to pet trading because of X, Y and Z, and TNT take away Z, that can only be a good thing. 08/09/Y10: In light of some unfortunate behaviour I saw on the HC tonight, I'd like to politely remind readers that Pets are Priceless is not about attacking individual traders. Our issue is with the concept of trading itself, not those caught up in it. By all means talk to your friends about why trading is a bad idea, but I will NOT authorise unprovoked or ad hominem attacks on random traders who happen to be on the Neoboards. It gives a terrible impression of our side and could get you into real trouble. 06/09/Y10: Thank you SO much to everyone who voted for Becky's "not an item" picture! She placed first in her species, my first ever gold trophy! 28/08/Y10: Well, the ditzy Brit is back from holiday, and the petpage glitch has been, if not fixed, then at least got around. Time for an update. 25/05/Y8: I'd like to make a small public service announcement. From now on, I'd prefer if people didn't make topics about this page on the Help Chat. There are plenty of places where this subject might be appropriate-- Neopian Pound, Fan Clubs, Newbies-- but the Help Chat is for questions, and repeatedly plugging Pets are Priceless there may do more harm than good. I have no desire to see any of my loyal supporters reported for spamming the boards. For all their suggestions, screenshots, and support I would like to thank the Rebel Alliance: in no particular order, alana_currie, fidicina, flingingfire, mazoku_kuiin, luvluvcrazyluv, rosie, tirmin, l0rd_anub1s, nyxienyx (thank you for the awesome layout), rackymcdouglas (for a screenshot of someone being ridiculous), popolopolis_the_3rd_ (snazzy button! ), zbryant, and everyone else who contributed screenshots. Please do not Neomail any of these people. If you have a question or comment about this page please Neomail me. I speak English, French, and German, and can understand although not speak Italian. My owner traded me for a draik! Make your voice heard by TNT. Use the submission form. Layout by neopets.com, edited by nyxienyx.